Christi Cones on Who’s America with Sacha Baron Cohen as aspiring ex-con artist. 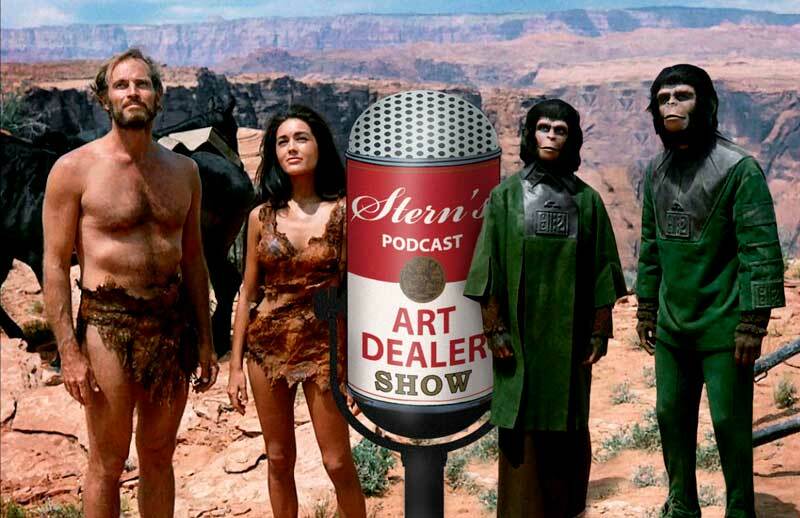 This is not your typical episode of the Art Dealer Show. If you have not heard the news, the often controversial comedic actor and social commentator Sacha Baron Cohen is back with a brand new show. And what does that have to do with the art business? Well, right out of the gate in his first episode he’s pointed his sardonic lens at one of our own—art consultant Cristy Cones. And we’ve got her on the show. Try to imagine that you have agreed to allow a UK-based reality TV crew film a sit down with you and an ex-con who has dreams of turning the art he started to make in prison during his recently completed twenty-one year stint. And then, when the time comes, in walks a hulking figure with a shaved head and a prison tattoo under his eye nervelessly clutching a folio. Over the course of a “getting to know each other” conversation, he reveals that after a cell protest when he smeared his own excrement on the wall, he became inspired to create works of art with the same medium. He then hands you a primitive portrait of his cellmates. Next you are informed that their shirts are made with another fluid that was involuntarily provided by one of his subjects. I’m not going to go any further but this insanity does. If you are asking “how would I react?” or just “what the hell?” then you definitely don’t want to miss this interview with the art dealer who got to live it. Be forewarned: this is the first episode that I’ve had to put a content warning on. It’s also the first one that I’m suggesting you have no less than two drinks to properly prepare yourself. Art Dealer, Art Galleries, Art Gallery, artist, christy cones, sacha baron Cohen, who is America permalink. ← 25. Galleries pricing art by the keystone rule and other fun ways to lose a business.